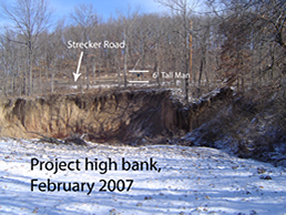 The city of Wildwood commissioned Intuition & Logic to design a channel stability project to address a rapidly eroding 30-foot tall, vertical bank moving towards Strecker road. 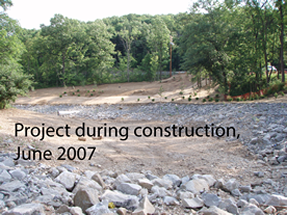 As part of the analysis, a panel of experts from the Natural Resources Conservation Service (NRCS), Wright Water Engineering and Intuition & Logic evaluated the problem. Intuition & Logic designed the interventions, prepared construction documents and obtained the necessary permits for construction. 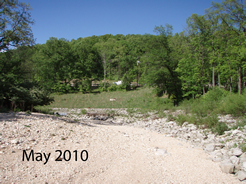 The final design rebuilt the eroded bank and relocated the channel back to its original location. 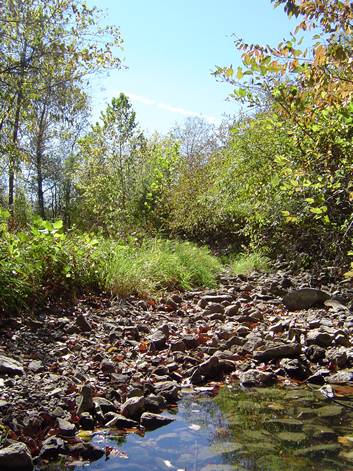 The lower bank was restored and stabilized with a vegetated composite revetment. The upper bank was planted with native riparian vegetation. 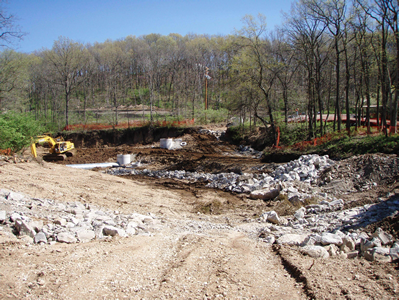 Stream energy is managed through the restored reach with two rock grade controls, one at each end of the project, and four stream barbs along the toe of the slope. These structures will deflect the flow away from the bank and toward the center of the channel.